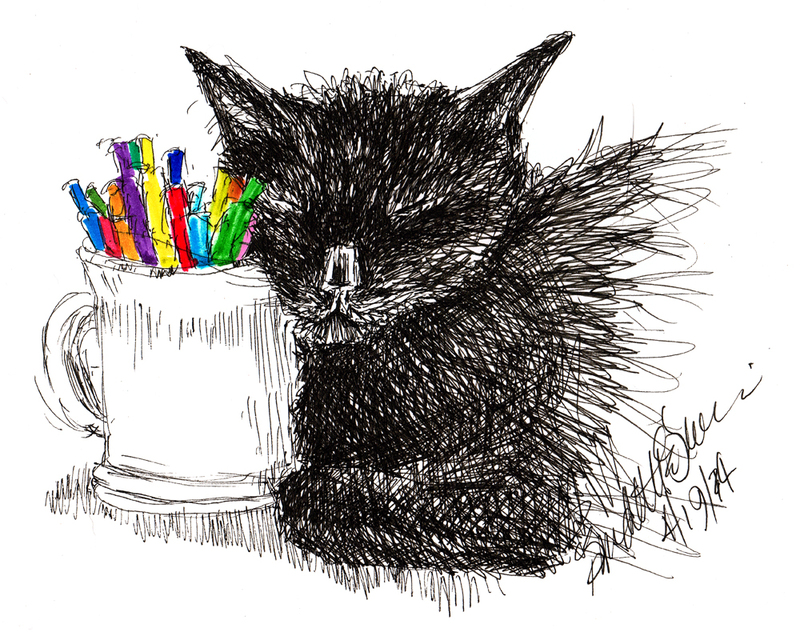 After much debate (with myself) about back-to-school themes, autumn colors, my own current favorites, and choosing a style I haven’t used in a while just to keep it lively, I’ve decided an ink and marker sketch black cat with his cheek resting on a cup full of colorful pens is a good choice for all of those things for the September Feline Featured Artwork. For once, this art doesn’t have a big story. Giuseppe must surely be absorbing some of the colors of the pens in my pen cup. I certainly thought the colors were inspiring next to Giuseppe’s black fur! Because he was sleeping I had the time to get more detail on his face than usual. Hope you enjoy it this month! 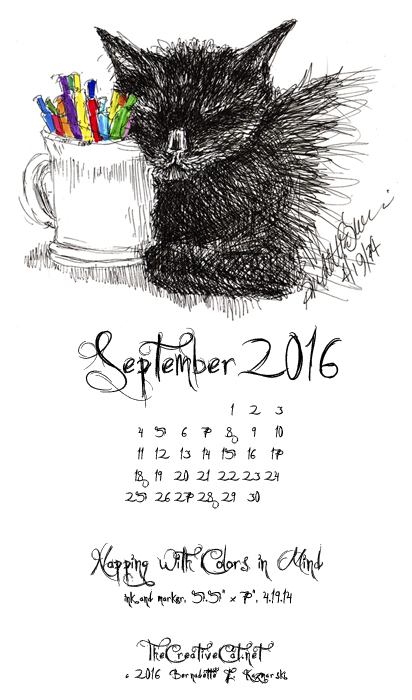 And don’t forget to register for an account and get a free matted print of this sketch or choose from several other sketches, paintings or photos of cats and other subjects. 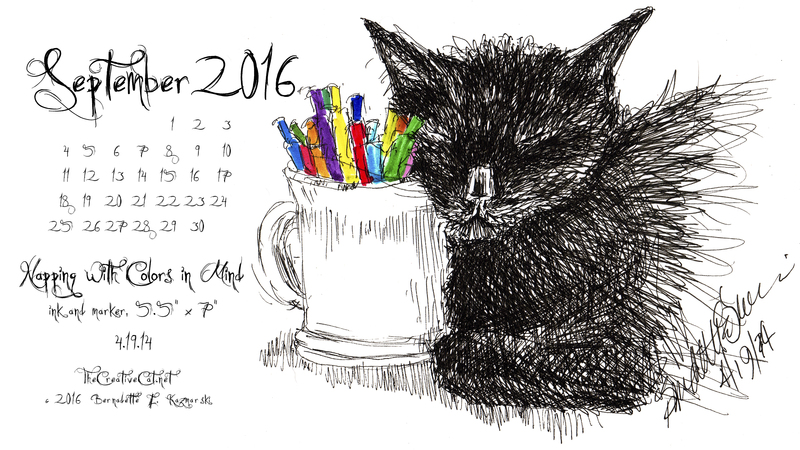 “Napping With Colors in Mind” desktop calendar 2560 x 1440 for HD and wide screens. 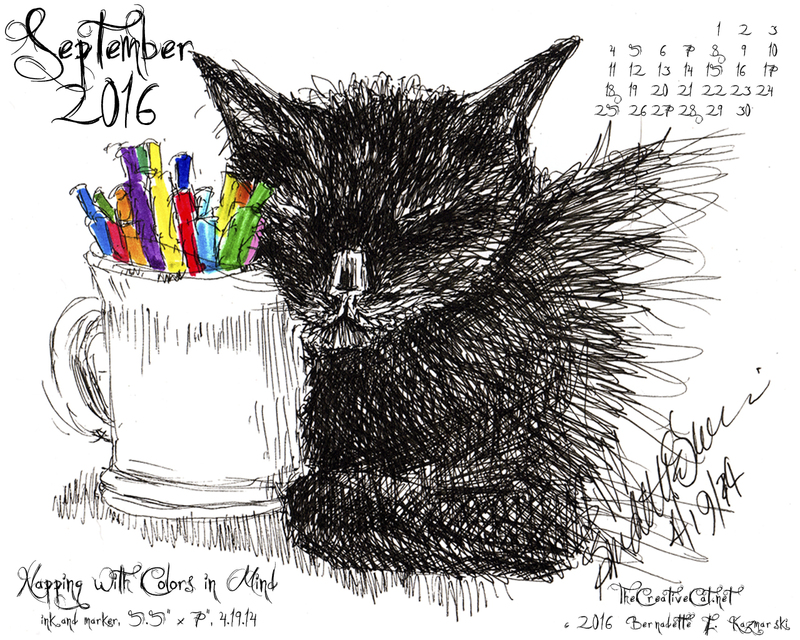 “Napping With Colors in Mind” desktop calendar, 1280 x 1024 for square and laptop monitors. “Napping With Colors in Mind” desktop calendar, 600 x 800 for iPad, Kindle and other readers. “Napping With Colors in Mind” desktop calendar, for 400 x 712 for mobile phones. 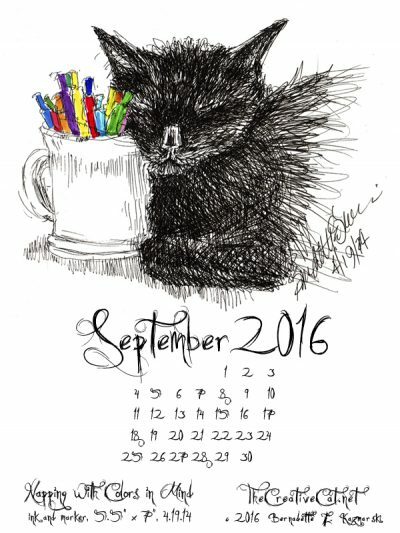 This entry was posted in black cats, cat artwork, Desktop Feline Calendar, Desktop Wallpaper Calendar, framed artwork, ink, marker and tagged black cat, black cats, cat art, cat artwork, cat sketches, cats, desktop calendar, feline desktop calendar, feline desktop wallpaper on September 2, 2016 by Bernadette.